Keeping that beautiful smile requires regular visits to the dentist. You may not look forward to a dental examination, but you can’t avoid it. 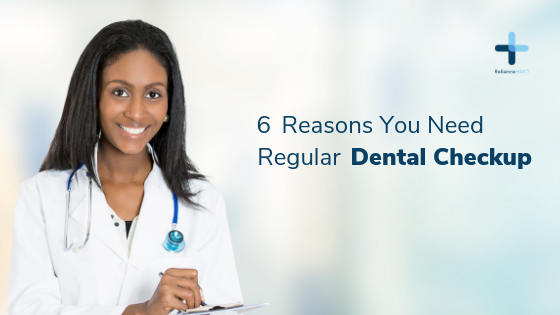 A dental checkup every six months is crucial to your health as skipping a dental checkup may save you time and money now, but can cost you much more pain, time and money in the long run. Fight Cavities: A clean up is a big part of a dental examination. No matter how well you brush and floss, there will always be spots that you miss out on. With time, plaque and tartar can build up in these spots leading to cavities if not addressed in time. The worst part about cavities is that you can feel them only once the tooth has been damaged. Thus, if you skip your dental examination, you may need a filling instead of a simple cleaning. Prevent gum disease: Plaque and tartar affect not only your teeth, but your gums as well leading to diseases like gingivitis and periodontitis. These are marked by shrinking of the gums that makes teeth sockets loose and eventually lead to tooth loss. Gum disease treatment can be very painful and expensive hence it is best to get plaque and tartar cleaned regularly before they begin to cause a problem. A brighter smile: Your daily cup of coffee or tea can stain your teeth with time. Wine and cigarettes also contribute towards making your teeth look dull. A professional dental cleaning can help remove these stains and give you a brighter smile. Find hidden problems: X rays are also an important part of a dental examination. An X-ray can detect problems that lie under the surface like misaligned teeth, bone decay, tumors and cysts. These problems rarely show any symptoms in their early stages and hence without an X-ray you would have to wait for it to advance to a more painful stage before seeking treatment. Boost overall health: Regular dental checkups can also lower your risk for heart disease and stroke. In addition to checking your mouth, a dentist will also check neck, jaw and lymph nodes during a regular check up for swelling and other abnormalities. This can help in the early detection and treatment of a number of diseases. Detect oral cancer: Oral cancer is easily treatable if diagnosed in its early stages. However, the only way to diagnose this correctly is by visiting the dentist. A test for oral cancer is pain free and takes hardly any time. So, think about it. Visiting the dentist is definitely worth it! !